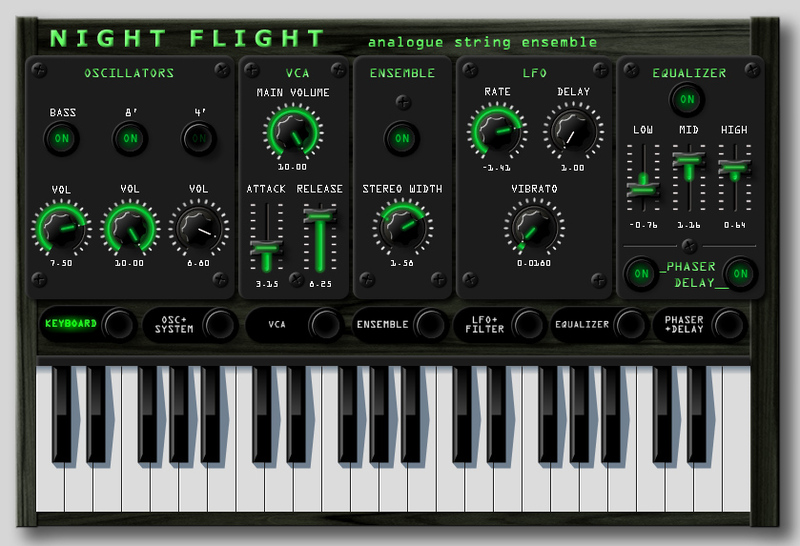 “Night Flight” is a VSTi plug-in for the Windows platform emulating the analogue string ensemble keyboards invented in the early seventies. String machines have been widely used in Pop, Rock, Funk, Reggae, Soul, and Disco music throughout the seventies and up to the early eighties when they were popular with New Wave acts. In recent years the sound has stirred interest again due to it's distinct character and undeniable vintage charm. “Night Flight” does not use any samples. It is based on an emulation of the ensemble effect first used by Eminent / Solina back in 1972 and an organ-like sound generation (octave divider). You will also find a number of features inspired by other string machines like the 3 band equalizer from the Crumar Performer or the Envelope Filter on the very rare ARP String Synthesizer. Besides the clearly laid out main panel there are 6 sub panels giving access to a large number of under-the-hood parameters like filter and amplifier modulations, ADSR, LFO, keyboard split points, equalizer automation and two additional simultaneous ensemble effects for even thicker pad sounds. Finally there is an onboard effect section providing the typical phasing and delay effects which are essential for some of the best known string machine timbres.